Need For Speed is a speedy action flick based on the video game series of the same name. The itself film is about a mechanic named Tobey Marshall (played by Aaron Paul ("Breaking Bad (2008 - 2013)")) who is not only great at building fast cars but is also a great racer himself. After winning a great race that took place all over his home town in upstate New York he is approached by his old arch enemy who is named Dino Brewster (played by Dominic Cooper ("Captain America: The First Avenger (2011)")). Dino Brewster wants to use Tobey Marshall's mechanical skill to help him finish a legendary car that wasn't finished due to one of the people that were originally working on it passed away. Tobey Marshall is not happy to see him but he accepts the job as he is offered twenty-five percent of the profit and the car is expected to sell for no less than two-million dollars (that's a lot of Steam Trading Cards). He manages to complete the car in only a few months. Not long after it's finished they show it off at a car show where he meets with a British woman named Julia Maddon (played by Imogen Poots ("The Look of Love(2013)")). Julia Maddon is interested in the car but won't let her boss buy it unless it goes really fast (320MPH to be exact). Tobey Marshall accepts the challenge and takes the car for a ride and is successful. Celebrating their sale Dino Brewster challenges Tobey Marshall and his best friend Little Pete (played by Harrison Gilbertson ("Beneath Hill 60 (2010)")) to a race where the winner gets the losers share of the profits. They have an intense race but Dino Brewster pulls off a dirty trick and knocks Little Pete off the road and ultimately ends up killing him. After the race Dino Brewster frames Tobey Marshall for the murder and gets him locked up (what a dirty piece of work he is). Two years later Tobey Marshall is released on parole and is hungry for revenge. He ends up contacting Julia Maddon so he can use the car he sold to her boss and goes on a cross-country search to find Dino Brewster so they can settle things once and for all. (Click "Read More" to read the rest of the review). 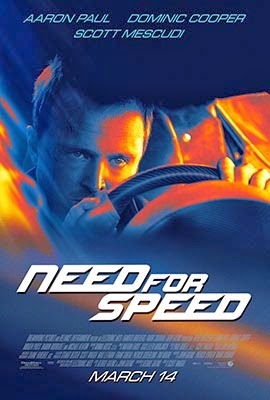 I was very worried when I heard the news that they were making a movie based on the Need For Speed games until I sat down and thought to myself "Isn't the Need For Speed series already cinematic enough as it is?". Turns out I was right as the story in this film feels just like it was based on the Need For Speed games. But now to answer another question that I had to myself which was "Will this movie be any good?". First of all this is not a film you are meant to take seriously and it has a very cheesy story with awkward dialogue and some painful jokes but it does have some legitimately funny moments. It also starts off a little slow but quickly picks up after the first fifteen minutes (give or take). Luckily all the talking is left to a minimum as seventy-five percent of this film is all action. The human characters in this film (I have a reason for saying "human characters" so bear with me here) are very generic and stock. You've got the lead man, the comedic sidekick in the form of the token black guy, and the damsel that tags along with the journey even though they don't want her to be anywhere near her. The actor that had the most character in this film had to be Michael Keaton ("Batman (1989)" and "Beetlejuice (1988)") who played a retired race car driver that is now a radio host of an underground street racing radio station. Personally I don't mind the human characters being the way they are as it works well with this movie as if they were anything special they'd outshine the real stars of the film which are the cars. The cars are the main reason why you would want to watch this film as they aren't only very beautiful looking but they are also very exciting to see race. The stunts and races were very well done and resemble more of racing flicks from the 1970's rather than the modern styled car films. Huge props to the filming locations as they actually made the race locations the best they could to look like the levels from the video games. I recognized locations that were heavily inspired by levels from "Need For Speed III: Hot Pursuit (1998)', "Need For Speed Hot Pursuit 2 (2002)", "Need For Speed Underground (2003)", and "Need For Speed: The Run (2011)" just to name a few. You will also notice that the cars are ripped right out of the games too. They did use some special effects for stuff like slow motion, some car crashes, and explosions but most of them were done by real cars and it added to the excitement of the film. Hearing the sound of cars roaring and speeding past in the surround sound is one of the main reasons why it is best to see this in cinemas as it was very exciting and got me feeling very powerful. It is such a shame that this film will lose a bunch of charm when the film hits home video. The soundtrack to this film was okay and worked but it was all cover songs of classic songs from the 1960's and 1970's and it would've been nice to hear some original music. The way the film was shot was really well done with some very nice clean shots that captured all the action perfectly with little-to-none shaky cam shots, even then when you did see the camera shake was done in a way where it made sense. The crew that worked on this film must've been fans of the games themselves as it's (arguably) one of the best adaptations of a video game turned into the movie. Not to confuse you with "greatest video game movie of all time" as there are some better ones based on video games that aren't as faithful to the source material. Normally I won't talk about special features in these kind of reviews but this film actually had a special feature right before the film started. What I got to see during the screening (right after thirty minutes of television ads and an awesome Godzilla trailer) was the first ten minutes of "Captain America: Winter Soldier (2014)" as a special preview. The preview was pretty good as it showed Captain America, Black Widow, and Agents of S.H.I.E.L.D. battling some pirates keeping people hostage on a ship. It has gotten me very excited to see the film and I want to watch it when it hits the cinemas. Downside was that the preview is very misleading for those who are walking into the cinema right before the movie starts and end up thinking that they walked into the wrong movie. I know as this has happened during the screening that I was at. Some people left and never came back and some people were confused until I told them what was going on. This special preview won't be shown for long as it's only for the first week of Need For Speed's showing and if you want to avoid confusion you should wait until the second week of the film's showing (which is more than likely to happen after this review comes out). I am also unsure that this preview will be played in every cinema but they are defiantly airing it at Hoyts Cinemas* (that was the cinema that I went to). Overall this is a dumb pop-corn flick that is best watched with a bunch of friends and family. It's not the greatest film in the world and won't win any awards (well maybe one for the stunt work) but it is far from being the worst film of all time and that's saying a lot for a film based on a video game series. I recommend seeing this film but watch it while you can while it's still in cinemas as what makes this film special will be long gone by the time it hits DVD and Blu-ray. Fun viewing. *Note: Referring to Australian cinemas only. I've always been a fan of the game series and love that little pint sized man Aaron Paul. I heard he like randomly pulled up to a group of people in a Lamborghini filled with free movie tickets, that right there makes me want to see this film.